Sarah�s family and friends are very grateful to have the �Sarah Turk Trophy� awarded to the winner of the Open Females category. Sarah died at the age of 26 on the 31st March 2008 after a nine month battle with the disease. This heredity extremely rare familial form of MND, not only took her life but the lives of her mother, grandmother, aunties, uncle and young cousins. 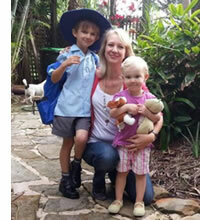 Sarah is remembered as a caring and loving mother, wife, daughter, sister, aunt and friend. She wore her heart on her sleeve and has been an inspiration to many. Her infectious smile and fun loving, �give anything a go� spirit left a lifelong impression on those who were lucky enough to have spent time with her. She would always have a laugh and was always the laugh of the party, but her greatest legacy is her children the love she has for them is �to the moon and back or around the world 13 times�. Within her short but full life, she achieved so much; the former Oak Flats High School student was a high achiever studying mathematics at the University of Wollongong. She was in the process of completing her DIP Ed in Education along with intense training for her new job in the Air Force. She represented the Illawarra in Basketball along with physical culture. When ever you said �Dance� Sarah was there. In fact it was her love for Dancing out in nightclubs that lead her to meet her future husband, Jayson. Her uplifting strength throughout her illness was inspirational, always caring for others before herself. Even during hard days Sarah still wanted to get together and jam with the Sizzle Sisters. 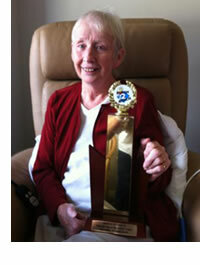 The highest individual fundraiser will receive the perpetual 'Michelle Moore Memorial Trophy'. Michelle's family and friends are honoured to have the "Michelle Moore Memorial award" to the highest individual �fundraiser. Michelle died 26th August 2013, aged 38 years. Michelle was loved by all that knew her for her gentle, kind and generous nature. She had a knack for storytelling, a wicked sense of humour, beautiful smile and a warm heart. Testament to her caring nature, she was committed to caring for her mother Carol, who had been diagnosed with MND 2 years prior to Michelle's diagnosis. In a heartbreaking turn of fate, Michelle was devastated when her own rapid deterioration of MND took away her ability to care for her mother and her young children. Michelle passed away only 2 months after she was diagnosed. She fought the disease with dignity and grace, remaining strong for everyone around her to the very end. Michelle's mother Carol passed away 2 months after Michelle. Michelle's family would like to express their sincerest �thanks�to�the organisers of burgh2beach in creating�Michelle's award. She will always be remembered by those that win her award and always loved and missed by her family and friends.